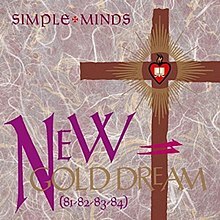 "New Gold Dream (81–82–83–84)" is the fifth studio album by Scottish rock band Simple Minds. The album was released in September 1982 by record label Virgin, and was a turning point for the band as they gained critical and commercial success in the UK and Europe. "New Gold Dream" originated in Simple Minds' unexpected popular and commercial success during an Australian tour with Icehouse, following the release of "Sons and Facination". The band was prompted by this experience to write "Promised You a Miracle" upon their return to Europe. Released in September 1982, the album made No. 3 in the UK Albums Chart. In the US, A&M issued some limited edition translucent gold with maroon colored marble vinyl pressings of the album. The record generated a handful of singles: "Promised You a Miracle" (released in April 1982), "Glittering Prize" (August 1982) and "Someone Somewhere in the Summertime" (November 1982). The title track saw a limited release in Italy, when the band visited the country during their tour in March 1983. In addition, the jazz keyboardist Herbie Hancock performed a synthesizer solo on the track "Hunter and the Hunted." David Stubbs has placed the album alongside ABC's "The Lexicon of Love" and The Associates' Sulk, a group of albums he has described as the "zenith" of pop music. "Every band or artist with a history has an album that's their holy grail," said Jim Kerr. "I suppose New Gold Dream was ours. It was a special time because we were really beginning to break through with that record, both commercially and critically. The people that liked that record connected with it in a special way. There was a depth to it: it created its own mythology. It stood out. It was our most successful record to date and, critically, the Paul Morley's of this world were writing very nice things about it." All tracks written by Simple Minds. UK Virgin V 2230 stereo (1982). Album produced by Peter Walsh.